Even when the flames of the massive Thomas Fire are not threatening homes, its plume of smoke is befouling the air breathed by literally hundreds of thousands in Ventura and Santa Barbara counties, and leading to increased hospital visits, according to officials. 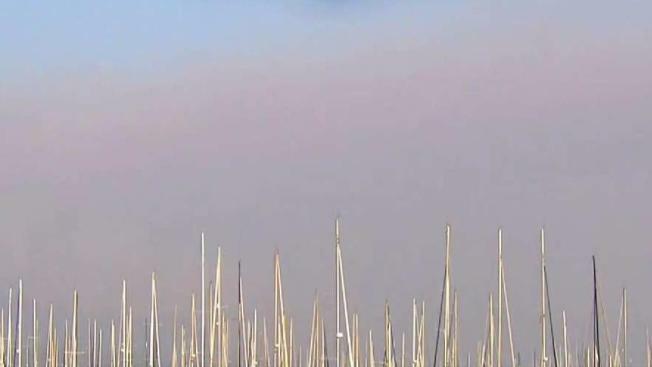 Since the wildfire began above Santa Paula a week ago Monday, elevated levels of tiny particulates in fire smoke have kept air quality in the unhealthy range in much of the area between the burn zone and the coast. "We have been measuring some of the highest levels we've ever seen," said Mallory Ham, air monitoring manager for the Ventura County Air Pollution Control District. In his county, there has been continuing concern for the Ojai Valley, where particulate levels from fire on three sides have led to prolonged periods of air quality descending to the worst category: "hazardous." In recent days, air quality along the southern Santa Barbara County coast has also plummeted into the unhealthy to hazardous range, according to Lyz Hoffman, Public Information Officer for the Santa Barbara County Air Pollution Control District. Hospitals and clinics in the county have been reporting 20 to 50 patient visits daily for issues related to air quality, said Santa Barbara County Public Health Officer Charity Dean, MD. Emergency rooms in neighboring Ventura County have also been seeing patients with complaints associated with the air pollution. "My chest felt like it was closing in," said Alexis Pintado, who moved to Oxnard shortly before the Thomas fire began. She said she has felt better since, but the smoky air still bothers her. Pintado plans to take classes next semester at Ventura College, and had hoped to make arrangements Wednesday, but discovered the campus closed because of air quality issues. For most adults, the impact of air pollution is usually temporary, and goes away as air quality improves, Dr. Dean said. But the effect for those with underlying health conditions can be more severe, and long term exposure can lead to bacterial pneumonia, she said. Strong Santa Ana Winds blew fire smoke off coast during the fire's first day, but since then the offshore wind has diminished. Even Ventura County's coastal plain, usually well ventilated by an onshore flow from the Pacific, was inundated in the fire's early days by smoke that has eased somewhat, but still ebbs with changing conditions, affecting air quality in Ventura, and to a lesser extent in Oxnard and Camarillo. A meteorologist by training, Ham attributed this in part to a mild onshore flow keeping smoke inland, but not strong enough to push it over the hills that surround the plain. What's more, still churning through brush on the slopes of the Santa Ynez mountains in the upper reaches of both counties, the Thomas Fire continues to generate more fire smoke, with ash and tiny particulates. Those smaller than 25 microns -- invisible to the eye -- are regarded as a particular health concern, and their concentration is used as the basis for categorizing air quality degradation from the fire smoke. Authorities recommend that persons living and working in the two counties continue to check air quality information every day. Ventura County reporting can be found here. For Santa Barbara's reporting, click here. So long as air quality is significantly depressed, authorities encourage anyone going outside wear a breathing mask rated N-95 or above, and insure it is snug fitting. Vigorous physical activity is discouraged, and those with health issues are urged to limit outdoor time as much as possible, Ham said. To maintain indoor air quality, it's important to make sure windows and doors are well-sealed, and run the HVAC to filter the air. Wearing a mask can get to be uncomfortable after awhile, said Avery Colgan, a Seattle transplant who now lives in Santa Barbara and works in neighboring Montecito. But with so many of her friends coughing or feeling ill, she keeps her mask on when outside. Longtime Santa Barbara resident Billy Cordero said he cannot recall so prolonged a period of thick fire smoke besieging the coast. A contractor, he's kept his crews off jobs since Thursday, waiting for air quality to improve, he said. Visitors to Montecito's shopping district Wednesday said the air no longer appears quite as smoky as earlier in the week, and some of the shops that closed then have reopened. "There's nothing you can do but keep up a positive attitude," said Erin Wagner, who cuts hair at Richie's Barbershop on Coast Village Road. Eager for fresh air, she said she and friends are planning to head east to Big Bear this weekend. Much of upper Montecito remains under evacuation orders, with fire continuing to burn on the slopes above. Evacuee Gretchen Leiff returned to get her dogs, and plans to take them with her to a ranch in Santa Maria, where other Montecito evacuees are also staying. "Go north if you can," Leiff advised.